Gamers — specifically Pokemon gamers — aren’t into traversing mountains, seeking out vistas, or exploring the world. They are definitely (especially in Asia) into the whole street pass thing where people carry their system around with them. I can’t tell you how many times I’ve seen a group of Japanese tourists at Disneyland all playing on their 3DS while waiting in line for rides. That’s a far cry from seeking out the experience of hunting pokemon by traveling to different locations. 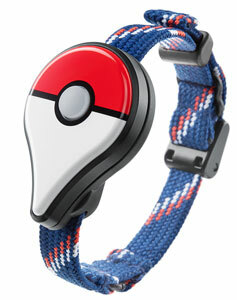 Lastly, wearing the Pokemon Go Plus watch-like device to alert you when there’s activity in your area is neat, but as a 30 year old professional I’m not wearing that on my wrist all day. Kids will probably wear it at school before rules are implemented to prohibit them. I just don’t see people, especially the ages depicted in the video, sporting these devices. Pokemon Go will be available in 2016 for Free with In-App purchases. 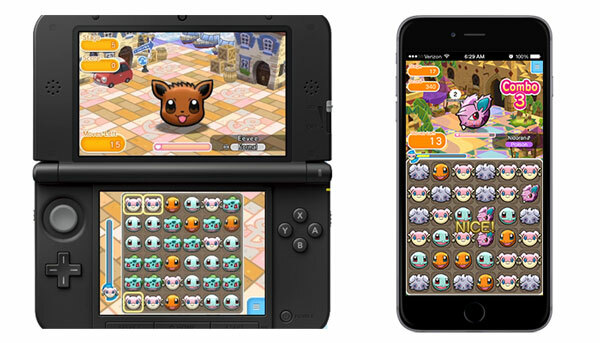 Another recent game launched for both phone and 3DS is a matching game called Pokemon Shuffle. Shuffle is one of those matching combat games. The more you match, and how you match, determines the strength of your attack. The objects being matched are Pokemon. You can equip 4 Pokemon at a time and matching them delivers their various attack types and powers. Gameplay is remarkably simple, and you are essentially guided down the path of which Pokemon to encounter and when. It’s fun in waves, and I’ve put in probably 2-3 hours of matching, but there’s simply not enough substance compared to other matching games that go as far as adding RPG elements. Each battle has a limiting factor whether it be the number of turns (matching opportunities), time, or both. While matching 3 is the minimum, you’ll want to do much more significant matches and form match combos to defeat more than the simplest of Pokemon. Being able to move any pokemon from anywhere on the board means your freedom to match is huge, but you’re expected to make use of the freedom as the difficulty ramps up (especially on expert mode). The most noteworthy element here is the price tag: $0. Shuffle is completely free. Scan the QR code there on the right with your 3DS and you can download it straight to your device for free. How do they make money? Microtransactions, and not a very elegant implement. The business model is Shuffle’s biggest misstep. You are limited to just a few battles at a time and have to wait real-life time to accrue battles again. You can buy more chances to battle in the cash shop if you like… but I have no idea why you would. They also sell plenty of other gimmicky upgrades. The time-limited play ruins my desire to play because I’ll often want to sit and play during my lunch break just to find out I was able to squeeze out only 5 minutes before out of turns. Shuffle is definitely not Pokemon’s greatest entry, and Pokemon Go seems to already be aiming to miss the mark completely for me. I have higher hopes for what Nintendo and DeNA come up with for the franchise, but I won’t be holding my breath. Walking around catching Pokemon might be cool if I was 11 but now? No thanks. It looks like that’s what it is though since they will be using Google’s location service thing. Hell, I would just be happy if I could catch Snorlaxes that are in my bed or find Magicarps in my fish tank. I have to disagree. My friends of all ages who are into Pokemon fell in love with the idea of Pokemon Go. I think it has to do with how self-conscious a person is about them self. Anime Boston has alone have thousands of Cosplaying Pokemon fans. I expect they and people like them will be hunting Pokemon and not care about appearances when it comes to the watch. This has the potential to be a success as long as you do not end up looking for Pokemon in dangerous neighborhoods. Being self-conscious doesn’t really come into play here. It’s not like you’re actually running around throwing pokeballs in public. This all takes place on the screen of your phone. The watch being optional, it seems to me like it’s only an accessory for the extreme enthusiast who travels and simply wants that engagement factor of knowing when there is something nearby. What matters is that you have a game designed for people who are travelers. When I can see market research data showing me that gamers who enjoy Pokemon also enjoy an active lifestyle and travel, or at least geocaching, we might have something to debate. I see this the same way I see the Kinect… people don’t even want to stand up off the couch let alone wave their arms. There is a small market for people who love to shout commands to a receiver and dance around to gimmicky controls, but that doesn’t represent gamers. The tens of thousands of people who travel around the world to conventions is not evidence enough they enjoy an active lifestyle? The gamer you are describing has long past gone and have become the minority. Gaming has become democratized. People game with their children before or after taking them to the kids’ sports meetup. Gaming is no longer depicted as being for shut-ins. Most people play games now. If it has not already it will overtake the motion picture industry in profits. That is where the market is: a vast and varied audience. The gamer I am describing is the lifeblood of the entire industry. Destiny doesn’t sell 6+ million copies to convention-goers. You’re describing hobbyists and enthusiasts. The number of people who go to a convention (you just said 10s of thousands) is a drop in the ocean when it comes to the number of people who play games. If we intelligently took this conversation back to Pokemon fans, let’s look at the number of copies sold for X and Y. Let’s then compare that to the number of people who go to Pokemon conventions. I think the last number I saw was 12 Million copies of X/Y sold. I can’t find Pokemon convention numbers, but let’s blow this out of proportion and look at how many attended PAX or E3. E3 2015 was roughly 50,000. I think PAX is around there. That’s like 0.4%. Even if we get silly and combine the total number of attendees to ALL gaming conventions, all comic book conventions, and all nerd conventions in 2015 COMBINED we are at a fraction of the copies sold. My debate is not that there aren’t people who would or do enjoy this type of lifestyle, hobby, or adventure. I never said, nor did I allude to, the idea that being a gamer meant being a shut-in. What I have maintained all along is that Pokemon Go won’t resonate with the general audience of pokemon fans, and it won’t resonate with gamers in general. Gamers simply aren’t that market. This is more of a gimmicky fun little side project, and there isn’t much ‘game’ here. P.S. – Video games passed movies long ago. I think it was 2008’ish. If we intelligently looked at what I was saying I was giving a single example. That example was to show it is a part of the bigger picture of gamers as a whole. Bringing it back to Pokemon crowd in its entirety those 12 million sold copies of X/Y and the market research I linked discussing gamers owning personal phones, most likely smart phones proves my point. Pokemon Go will be appeal to a broad audience. It can probably bring in people who do not own a 3DS or whatever Nintendo device. However, if they have smart phones and fond memories it would be easier for them to get into something like Pokemon Go. I honestly do not understand why the condescension from you. You asked for market research I gave it. I was being civil you and giving an opposing viewpoint. You were being overly and unnecessarily passionate and defensive. Also, I had a vague memory games surpassed movies but, because I was unsure I would rather be cautious so that is why I worded it that way. So the P.S. snark at the end from a 30 year old self professed professional feels a bit immature for you. Horrorshow, you’re assigning emotions and feelings behind my words that aren’t there. I’m not being snarky, defensive, or overly passionate. I apologize if what I have said came across that way. I’m having a discussion/debate on the merits of a mobile “game” as it pertains to a very popular gaming franchise. Before we go further I want you to understand there’s absolutely no animosity. Now, back to the subject. People own smart phones. Smart phones have broadened the definition of what being a gamer is and what it means to play games. Absolutely. No doubt about that. Smartphones are also an avenue for reaching more people who do not own handheld systems. Again, no question. I’m looking specifically at Pokemon Go, and specifically at who would participate in the “game” of looking around real world locations. Let’s break it down. 1. The person has to be interested in Pokemon, or at least the idea of Pokemon and catching digital monsters by doing battle with them. 2. The person has to want to spend time and expend effort traveling, whether locally in their city or to major destinations (these details remain unseen) to find these opportunities. Will it be cool a couple of times to explore your local area and see if you can catch a Pokemon in the Walmart parking lot? Yeah. I’ll even try it out. But it won’t be an App I use regularly. It’s not a regular game. I can’t consume this product the way I can a normal game like Pokemon. Gamers as a whole aren’t into the gimmicky stuff. That doesn’t mean no one will play/use the app. Lots of products that flop miserably sell tens of thousands, and many even have thousands of people who enjoy them. It’s like TV shows. A TV show might run for a season and get canceled. Happens to me all the time where I love that show. Why is it canceled? It might have resonated with people like me, but millions of others who are the core audience for that time slot and station weren’t interested. I am glad there is no animosity. And I am also glad to be supportive of you throughout the years. Here is to another, gosh, 7 years of being a part of the community. Right on! We have our 10th anniversary of the blog coming up soon. I can’t believe we’ll almost be able to say we’ve been providing gaming commentary for a decade. I imagine a future where we all eventually have Google Glass type devices on us to help with our daily lives. It’d be only natural for a fan of Pokemon to have their favorite team accompany them as they head out to the grocery store. I know I’m getting wayyyy ahead of myself, but I just see products like this and get really hopeful that Nintendo is full of dreamers like myself who see a big picture like this in the not-too-distant future. I’m not entirely sure as to the extend of Nintendo’s involvement with this project. Granted, Nintendo’s 33% (+54% ownership of Game Freak) may mean they are indirectly involved. Right now, until someone shows me evidence to the contrary, I see it as another Kinect, Virtual Boy, Wii U waggle stick, etc. Nintendo toned down their ‘wave your arms like a lunatic while playing’ when they launched the GamePad with Wii U. It simply made more sense with what gamers want. Nice discussion you had there, I enjoyed both the article and the comments, however I think you are all missing a huge point: this is going to e a free Pokemon app (not really a game). This almost certainly translates to timers, gameplay limiters and a vile pay-to-gain system. Thus, my theory is that this wont be meant neither for the gamers or the walkers, but for that 10 minute wait for the bus, on a line or something of the sort. It absolutely will not be marketed as such, but deep down that is what it will end up like. Still, its a cool concept and Im looking forward to trying it out.